Prominent & Leading Manufacturer from Surat, we offer magicblox (magicrete aac blocks), magicblox (construction aac blocks) and bricks. 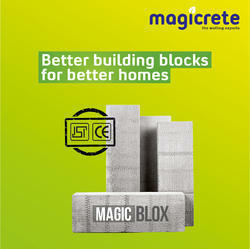 We are offering Magicrete AAC Blocks to our clients. Size (Inches) 12 In. X 4 In. X 2 In., 9 In. X 3 In. X 2 In. AAC Blocks are a cost-effective and environment-friendly substitute for red clay bricks as a construction material for making walls. Approximate 80% of volume in AAC Blocks is air, making its weight less than a third of clay bricks. AAC is lighter than traditional bricks and hence reduces a dead load of building thereby saving on cost. Their lightweight and tensile strength allow them to resist small earthquakes better than clay bricks. Its unique cellular structure provides for excellent fire rating. due to this cellular structure, AAC Blocks do not disintegrate, even in a fire. Up to 30% Savings on your electricity bills due to high insulation. AAC blocks resist the wetting of inside wall during heavy rain. We also serve in Gurgaon, Ghaziabad, Noida, Greater Noida, Agra, Lucknow, Kanpur, Jaipur, Neemrana, Bhiwadi, Jodhpur, Kota, Haryana, Punjab, Uttarakhand, Himachal Pradesh, Jammu Kashmir, Faridabad.